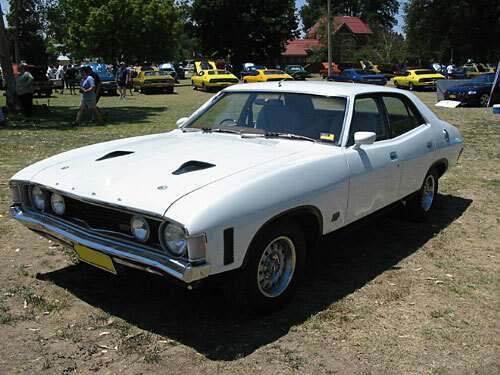 This will be a page dealing with the paint schemes applied to some of the classic X-series Australian Fords. 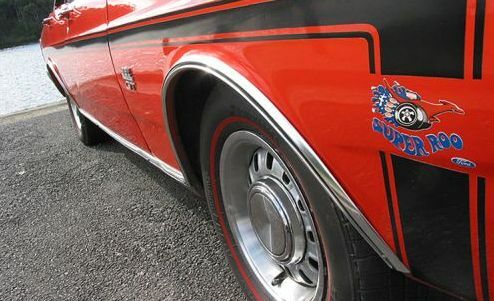 By its very nature, the subject of paint is huge and as such, we want to touch on some of the more unusual aspects of paint schemes, and try and provide a background to how some of the codes and paint coding works. 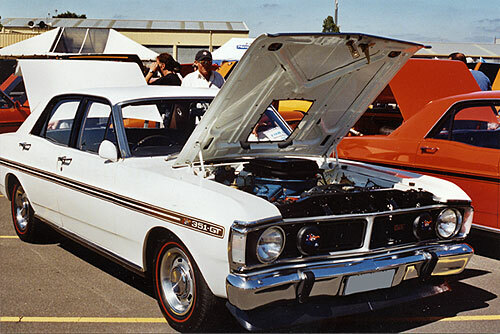 Through the years of the X-series Falcons and Fairmonts, Ford relied on a series of alphanumeric codes to differentiate the colours that they painted their cars. These codes appeared on option specification sheets, and on the compliance plate of the car, but, as far as the customer was concerned, he or she was presented with a nice colour brochure from which to choose a colour. Here is that colour chart for the XA. And here is the specification and option sheet for an XA. 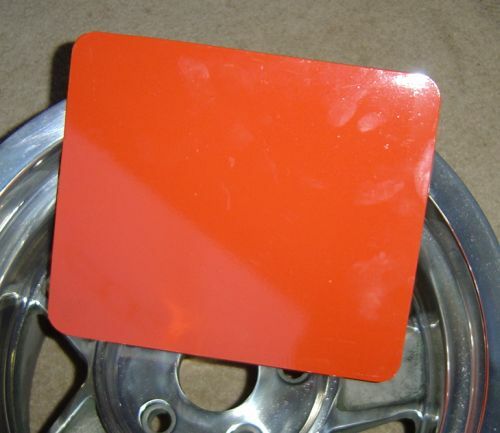 If the customer chose Red Pepper from the colour chart, we can see from the chart that that is paint code ‘X’ and hence, paint code ‘X’ shows up stamped on the compliance plate for the car, as below. 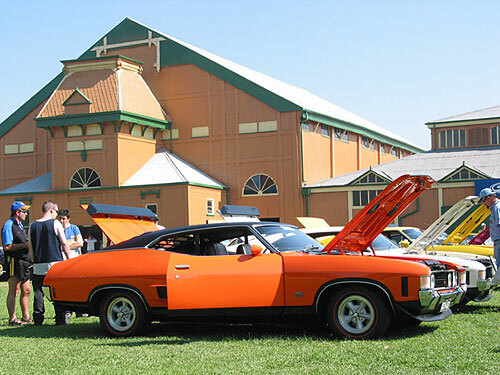 Ford of Australia was a large company, and Ford worldwide was huge, and they supplied many vehicles to many companies which were painted in what could could be termed ‘corporate colours’, in other words, a colour that was synonomous with that commercial organisation. 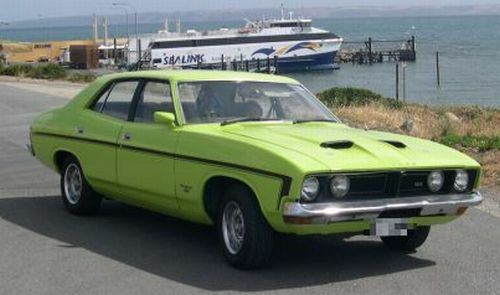 Ford maintained a huge list of these colours based on Dulux formulae, and while they were usually restricted to vehicles supplied to the commercial organisations, occasionally, deliberately or by accident, these colours slipped out into the wider world. 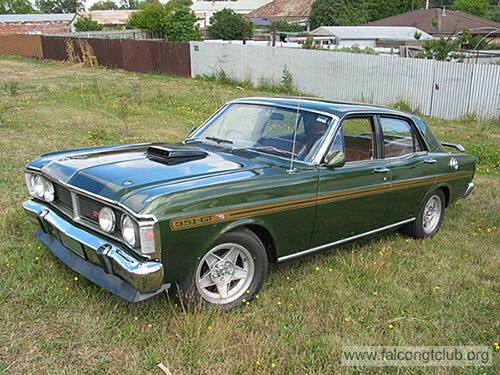 We will restrict our examination of corporate colours to the GT model, for the simple reasons that the GT Falcons are the only models for which extensive figures and research has been released by Ford Australia, and the GT is now a highly collectable car with much interest shown in the cars providing a wide and historic photo database. 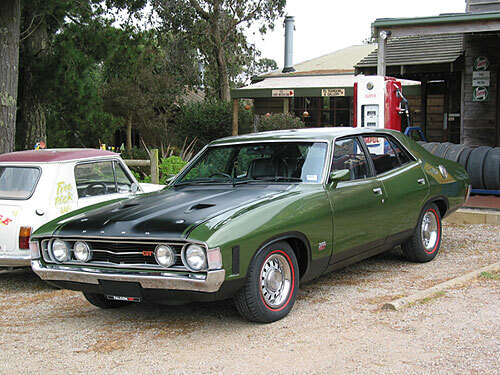 As ever, we are highly indebted to the Falcon GT Club of Australia, their members, site webmaster and historian. 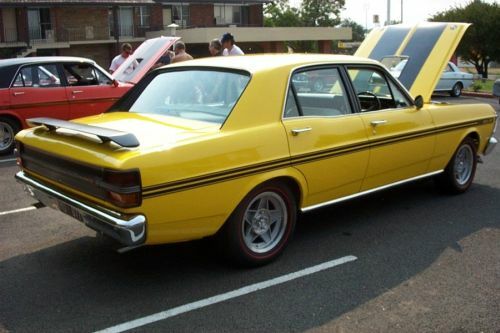 The XR GT is most famously known for introducing the GT Gold paint colour, and most folk would be mistaken for believing that all XR GT’s were painted this colour. Of the 684 manufactured, 671 were gold, and 13 were not. 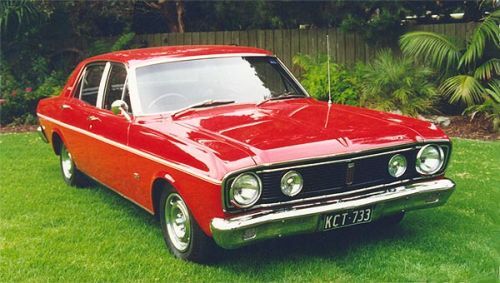 These 13 cars were split between six further different colours, four of which were standard option colours for the XR model Falcon, and two of which were special ‘corporate’ colours. In this context, F131 is the Ford fleet representation. 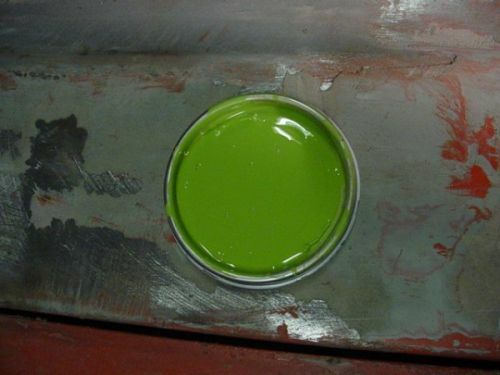 The colour scheme was also known as Y131, and it is the ‘Y’ code that most commonly appears on the compliance plate in the paint section as an alternative to the single digit alphanumeric code. The Dulux formula for Avis White is 8986. 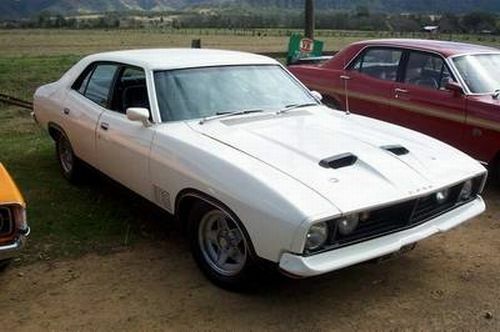 There only seems to be one ‘Avis’ colour listed in the Ford charts, and it is this white. This car was built for a Ford executive. 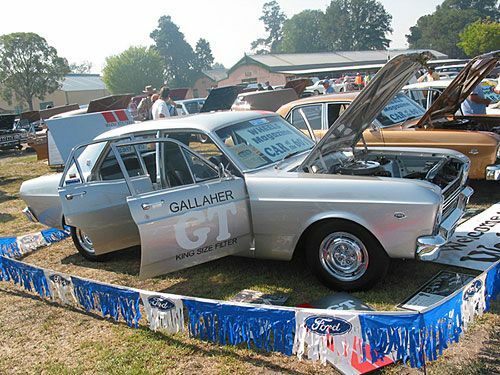 Gallaher commissoned Ford to build 8 XR GT’s painted colour F166, Gallaher Silver, and used them for promotion work. 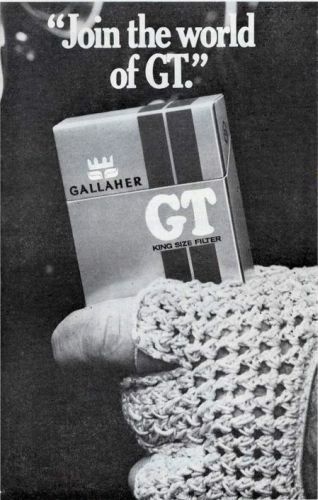 At the time Gallaher was sponsor of the 500 mile race at Mount Panorama, Bathurst; Ford were keen to enter their new XR GT model in the race; and Gallaher had a new range of cigarettes to promote, the GT King Size Filter. Hence, they all came together, to great effect, on the 1st of October, 1967. 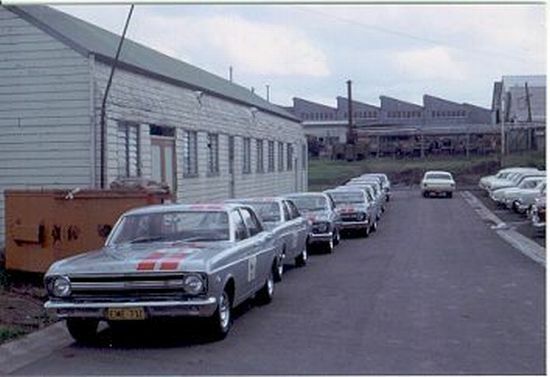 The eight Gallaher Silver cars together. If you have been doing the maths you will see we have accounted for 9 of the 13 non GT Gold cars. For the record, the other four cars were one of each:. Russet Bronze metallic, which was another non-option paint colour, Z782. 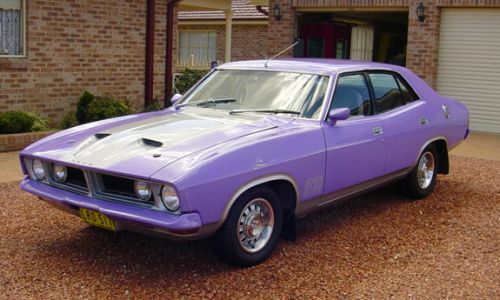 There was one XR GT built of this colour for Bill Bourke, then head of Ford Australia, and acknowledged to be the ‘father’ of the GT. Note, he had driving lights fitted to his car. Sultan Maroon metallic, which was option code ‘F’. 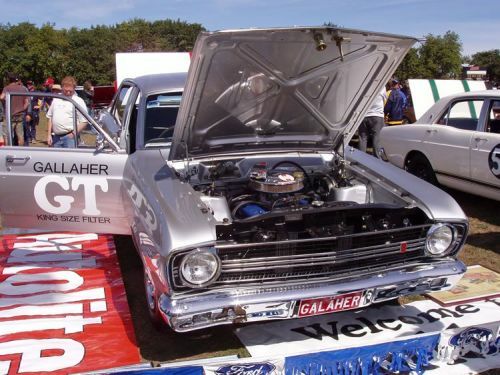 This was the car entered by Bob Jane and Spencer Martin in the 1967 Gallaher 500. Polar White, option code ‘E’. 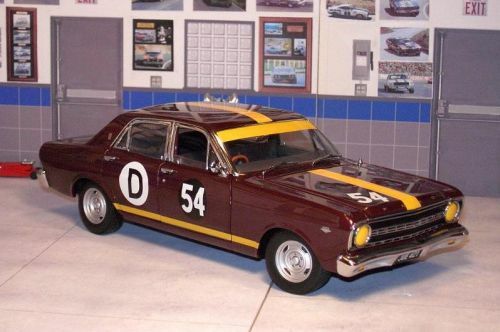 This was the car raced by the Geogeghan Brothers at the 1967 race. Ivy Green metallic, option code ‘X’. This was the race winning car of Fred Gibson and Harry Firth. 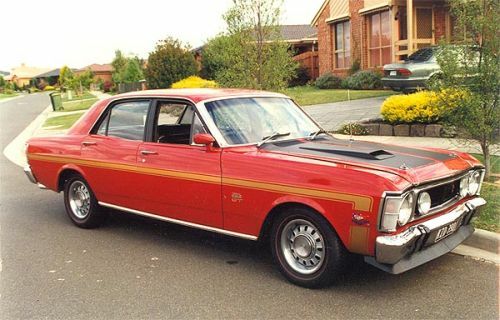 There was one colour offered on the XT GT that can be considered a ‘corporate’ colour, that is F117, Brambles Red. 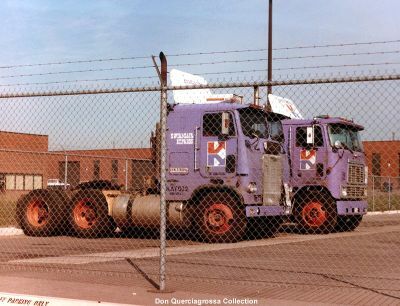 There were four cars painted this colour, two were explicitly tagged as being F117, but a further two, although being painted Brambles Red, were not tagged on the compliance plate as such. Unfortunately, we have no photos of a Brambles Red XT, but the colour carried through to the XW model so we will provide an illustration and explanation there. 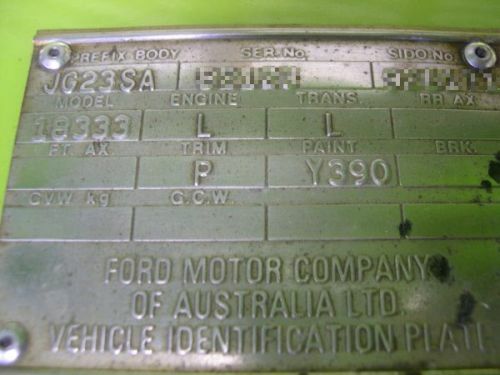 However, at this point it may be interesting to illustrate that very few of Ford’s US colours actually transferred over to the Australian range of Fords. 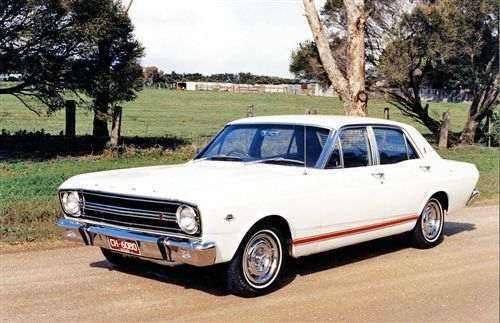 Comparison with the 1968 US Ford colour chart shows that only one colour crossed the Pacific: Candy Apple Red, option code ‘G’.. 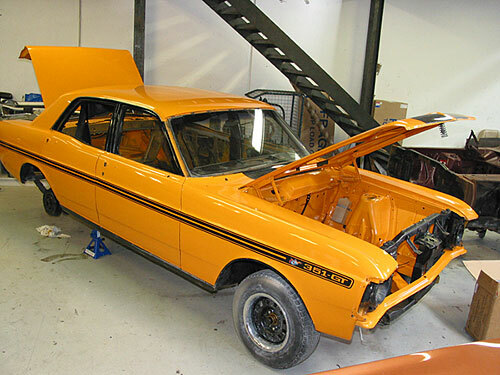 This was a popular colour for the XR GT, 331 being so painted. 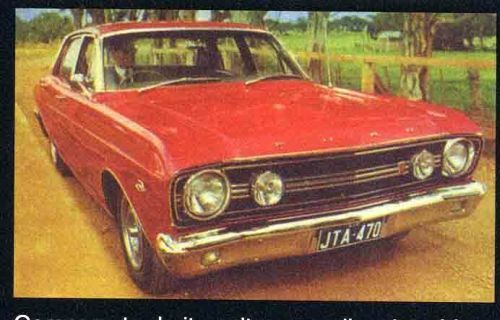 However, it also should be noted that XT GT’s, first released in 1968, were also painted two year earlier, 1967, US Ford colours; Vintage Burgundy and Springtime Yellow. 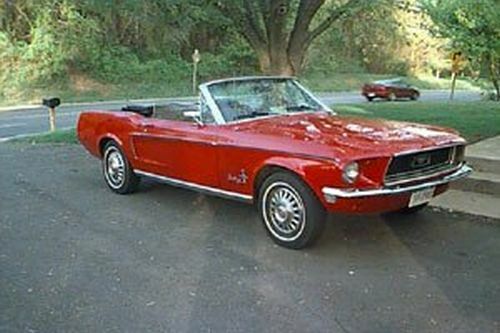 Again, a photo of a Vintage Burgundy, option code ‘F’ XT GT is not available, but here is the colour on a 1967 Mustang. And Springtime Yellow, option code ‘A’ and five produced on an XT GT. 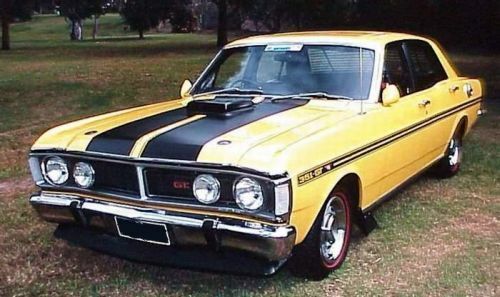 There were three colours offered on XW GT’s that could be considered ‘corporate’ colours: Y016, RACWA yellow, Y117, Brambles Red; Y099, Shell Yellow: and Y264, Fanta Orange. 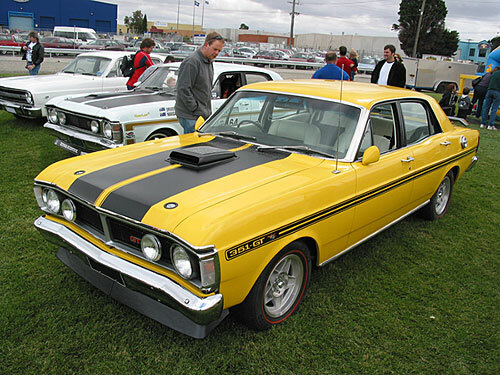 There was one XW GT painted Y016, Royal Automobile Club Western Australia yellow. 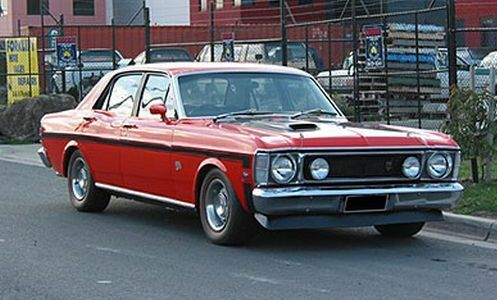 Y117, Brambles Red, is probably one of the most famous of the fleet codes because it was used as Ford’s colour scheme for its XW GT race cars. So where does Brambles Red come from ? 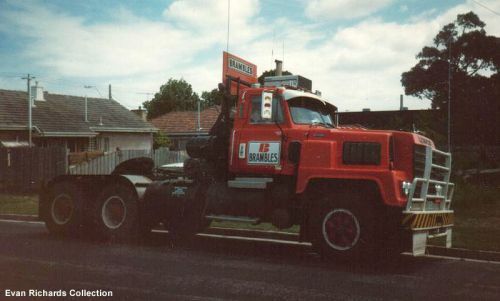 Brambles is actually the name of a long established Australian trucking company who painted their trucks a distinctive red colour, which Ford offered as a fleet option, F117. 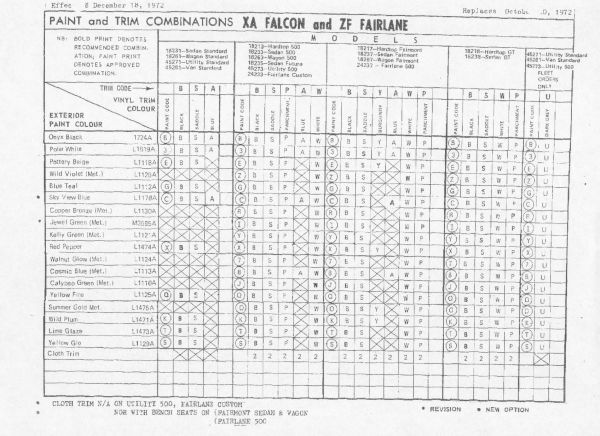 Of the 239 XW GT Falcons painted Brambles Red, 61 are tagged on the compliance plate as Y117.
. 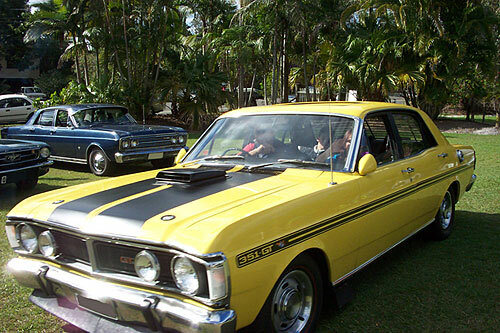 There were two Shell Yellow XW GT-HO Phase2 Falcons built in August, 1970, right at the end of the XW model run. 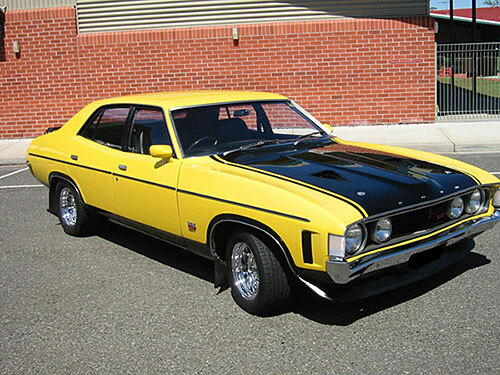 These were the only XW GT’s built in a yellow colour of any sort. Shell Yellow probably needs no description or explanation. 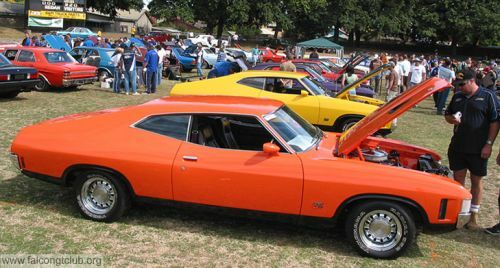 There was one XW GT-HO Phase2 built, like the two Shell Yellow cars, in August, 1970 painted Fanta Orange. Quite why ? Who knows ? 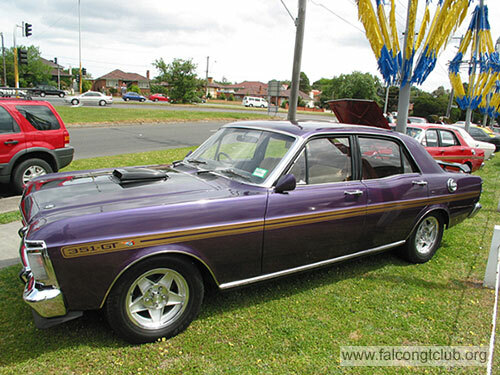 But a GT Falcon painted in this colour must have been quite a sight. 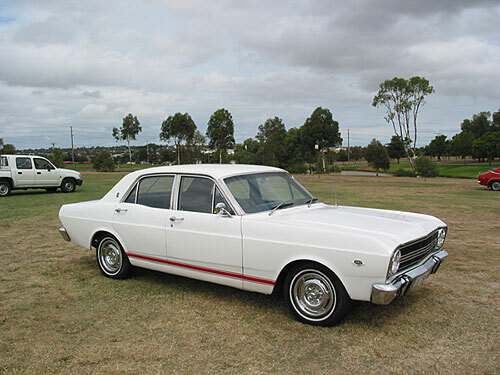 It is worth pointing out that, as before with the XT, Ford Australia offered one contemporary - 1969 - Ford US colour for the XW, Candy Apple Red, code ‘G’, and one older Ford colour, Vintage Burgundy, code ‘F’. 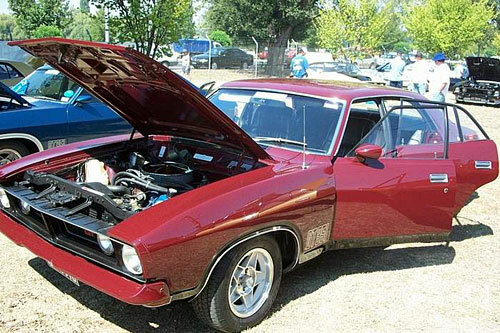 Candy Apple Red XW GT, 512 produced. 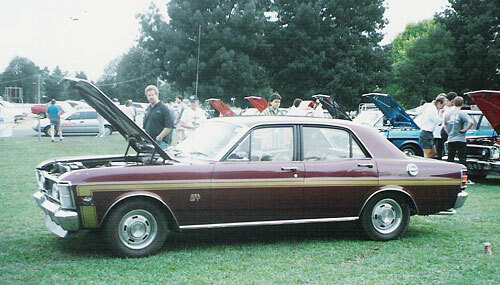 Vintage Burgundy XW GT, 4 produced. 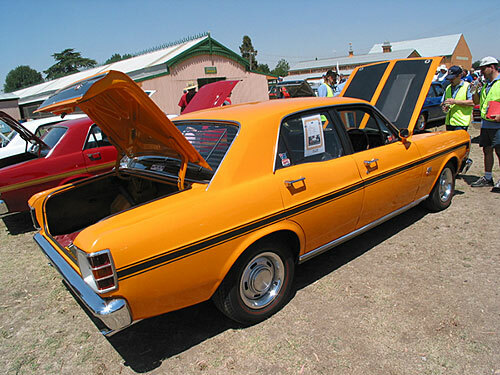 There were, again, three colours offered on XY GT’s that could be considered ‘corporate’ colours: Y099, Shell Yellow; Y269 RAA Yellow; and Y240, Agfa Orange. 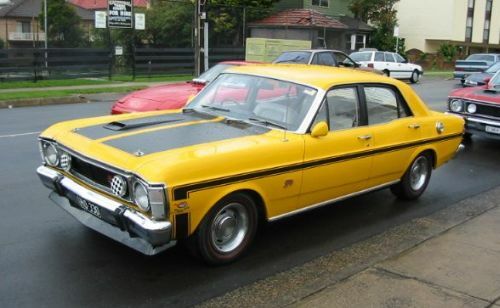 There were three Shell Yellow XY GT-HO Phase3 cars produced in June, 1971, one of which is known to survive. While there were only three factory painted Y099 cars, there were two others that were subsequently painted Shell Yellow to reflect their sponsors support for racing. 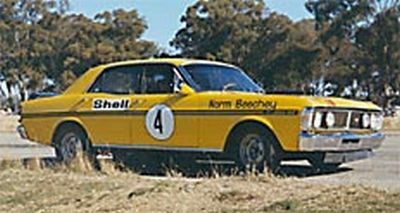 One was the ex John French factory Phase 3 race car which was campaigned by long time Holden driver, Norm Beechey, for Ford in 1972. 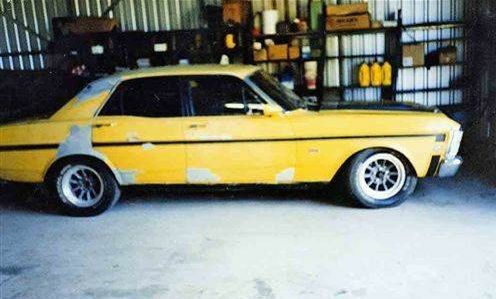 The car was an originally ‘red’ and the Shell Yellow paint was just shot over the top. 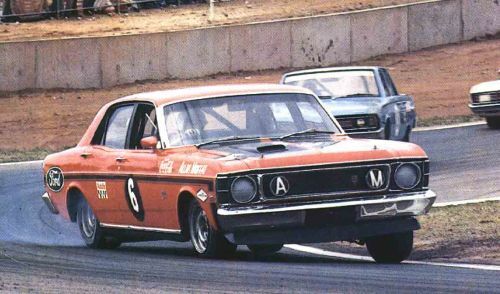 The other race car was driven by long time Ford supporter, Murray Carter. 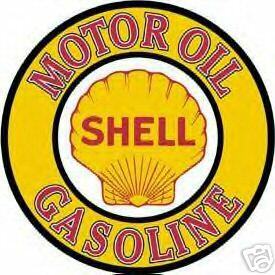 He had bought a Phase3 for competition in 1971, and secured sponsorship from Shell. 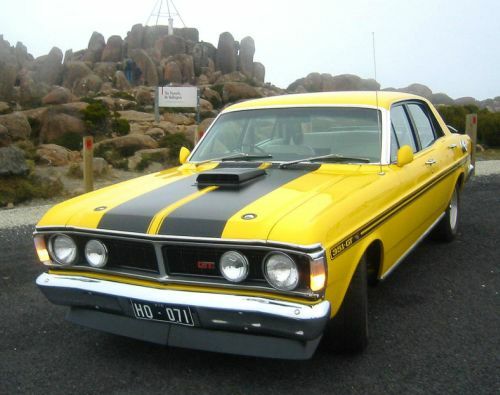 Initially this car was red also, but for the 1973 championship season it was painted Shell Yellow. Y260, Royal Automobile Association Yellow. 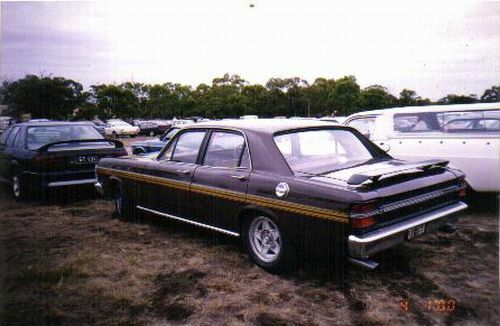 There were three XY GT’s built that were painted the colours of the R.A.A. of South Australia. 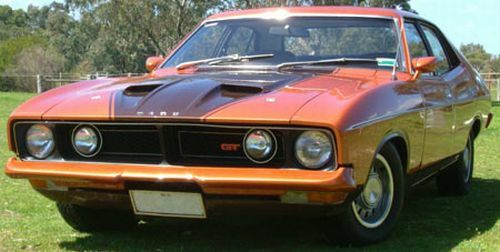 There was one XY GT, built in February, 1971 that was painted Agfa Orange. 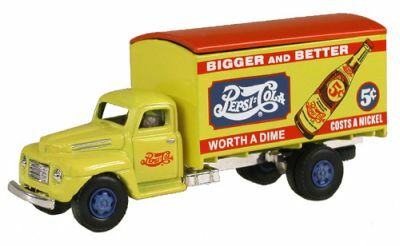 Another strange ‘commercial’ tie-up ? 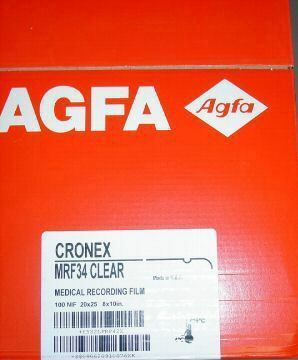 We have no photos of the car, but Agfa Orange looked like this. 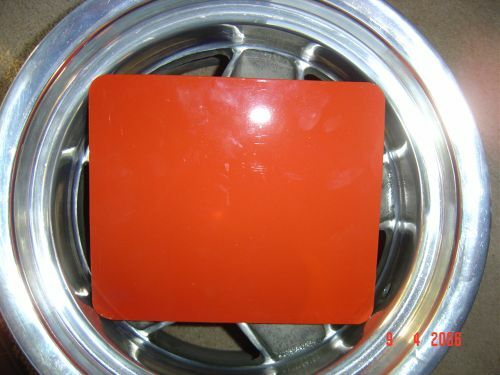 And here is a painted swatch panel of Agfa Orange. In sunlight it turns a slamon pink colour. There is one extra XY ‘fleet’ colour that we have yet to mention, and it is, frankly, bizarre: Y015, Aviation Surface Orange. 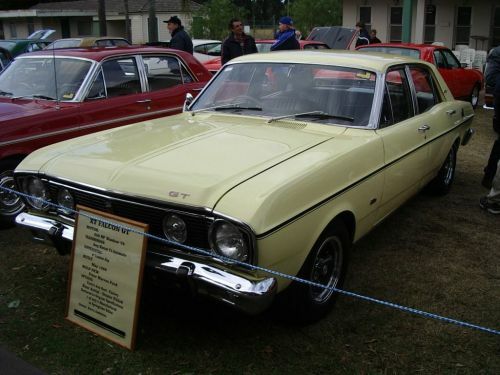 One XY GT, built in July, 1971 was painted this colour, according to Ford records. What is Aviation Surface Orange ? Quite simply, it is the orange paint used to paint, in a chequerboard pattern with white, any structure that is over 200ft in height in the vicinity of an airport. The best thing I can do is refer you to this site - a pdf file - that defines the FAA’s regulations for painting such a structure. Quite why anyone would want to paint a car this colour, never mind a performance car - or maybe there was some method to that ordering madness - is beyond us ? But here is an XY painted Aviation Orange. 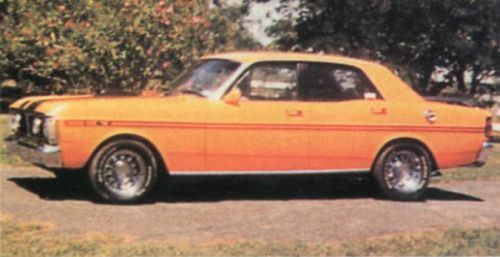 And here is what we believe to be the original one off Aviation Surface Orange XY GT, as it was advertised for sale some years ago. You wouldn’t miss it, that’s for sure. Which, we guess, was the whole point. 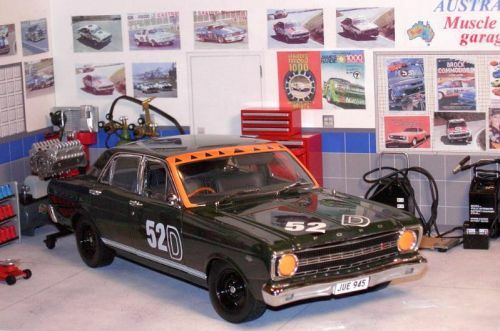 It is worth pointing out here that for the XY GT’s Ford once again used Brambles Red as their corporate racing colour. However, one car crashed and it’s replacement, originally a white car, was hastily painted red. 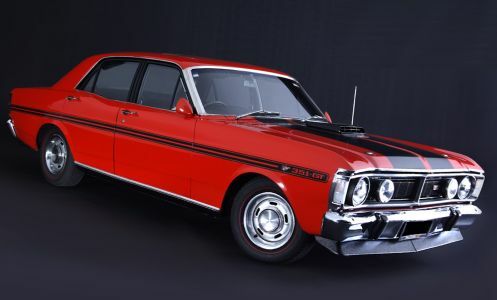 Unfortunately, it was painted the ‘wrong’ red and ended up being Vermillion Fire, paint code ‘6’, Vermillion Fire was the most popular colour for XY GT’s. 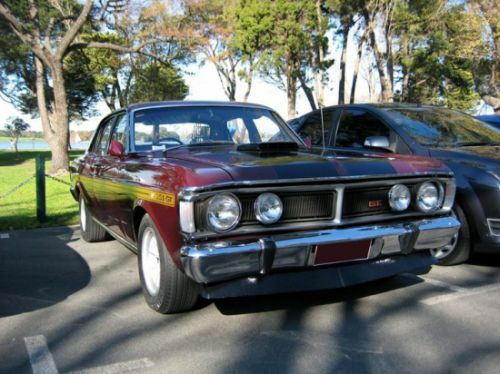 Yet again, Vintage Burgundy survived into the XY range with 13 GT’s and 3 HO’s built. 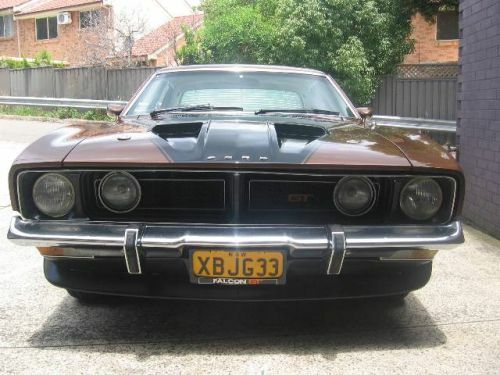 Although it may not seem like it, the colours available on the previous GT’s have been fairly simple. 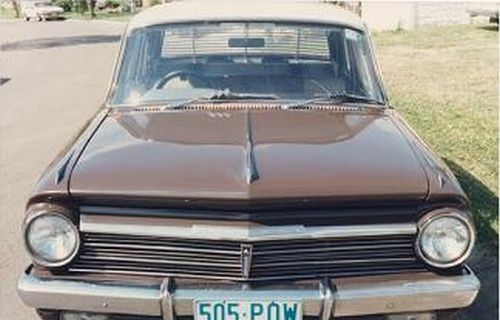 When it came to the XA - and the XB - then all hell broke loose. Let’s take a look at the colours that were not defined by a single letter alphanumeric code, starting with the ‘corporate’ colours. Y083, Repco Green; Y099, Shell Yellow; Y107 Ansett Blue; Y113, Rothmans Blue; Y117, Brambles Red; Y120, Daimler Blue; Y152, N.S.W. Ambulance White; Y154, Betta Primrose; Y157, MacRobertson’s Old Gold; Y269, R.A.A. Yellow; Y345, Readymix Orange; and Y045, Corporate Blue. 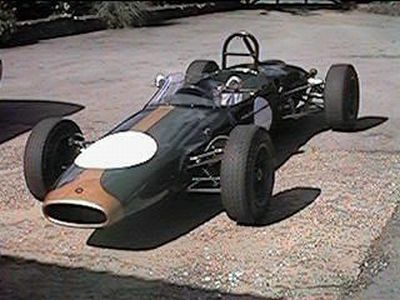 Sir Jack Brabham won the Formula One championship in 1966 with a car of his own design, and name, and powered by an Australian designed - Repco - engine. 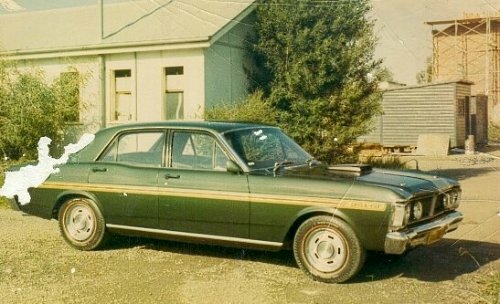 His race car was painted a green colour, and I have made the assumption that this is Repco Green, although, it must be pointed out that Ford also had a colour called Y174, Repco Brabham Green. 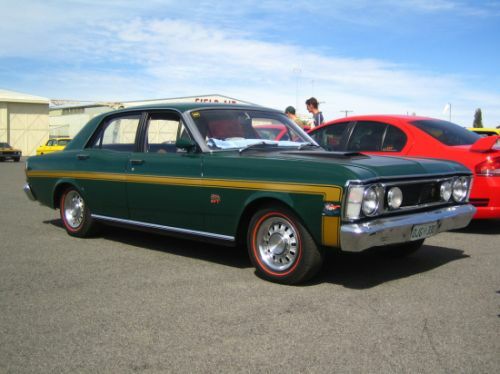 There was one Repco Green four door XA built, and it was an RPO83 car. 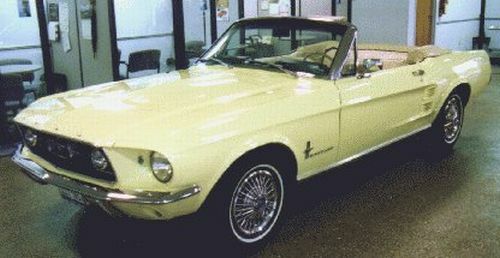 There was one Shell Yellow XA hardtop built, in December, 1972. 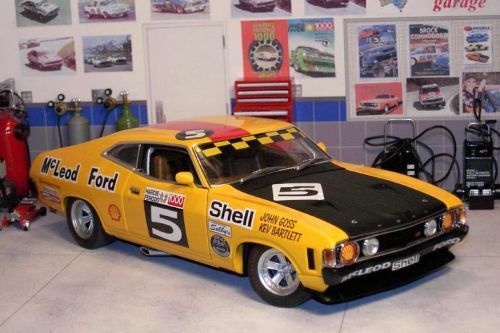 It is not the most famous Shell Yellow XA though, as that was originally a Yellow Glow car that John Goss painted Shell Yellow for his sponsors and which he raced in the 1973 Hardie Ferodo 1000. 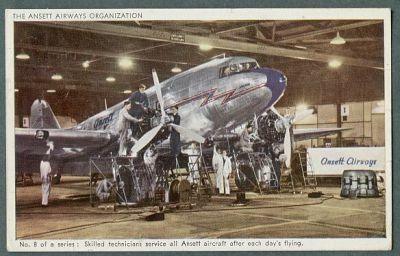 Ansett was an Australian airline founded by Reg Ansett in 1935. It went bankrupt in 2001. Originally the company was known as Ansett Airways, then Ansett Airlines of Australia, and finally Ansett Australia. In its final days, the aircraft tails were painted a striking blue shade, but in its heyday the aircraft carried an orange colour scheme. 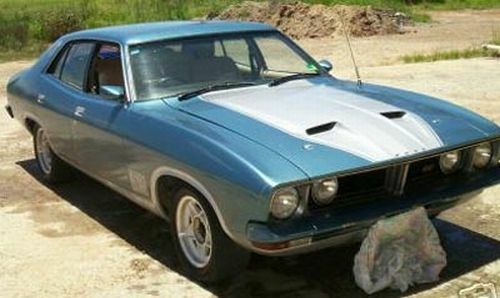 Not much help if we are looking for a colour called Ansett Blue. 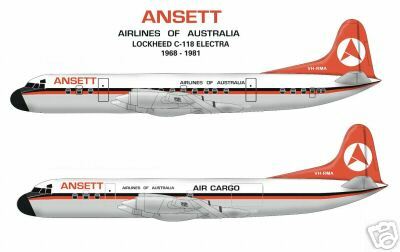 However, here is an older picture of an Ansett aircraft, and yes, the paint scheme features blue. So, that could be the Ansett Blue, perhaps ? 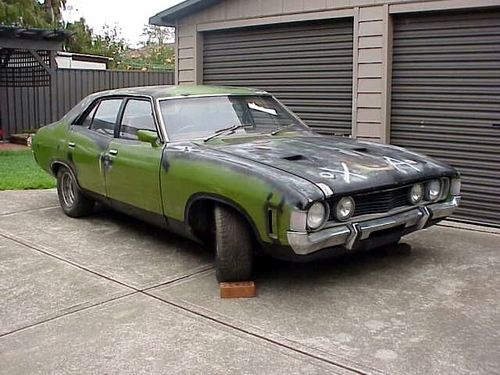 Now, all we have to do is compare it with the one, and only, XA GT that was painted Ansett Blue. This car still exists, and it is an RO83 car too. 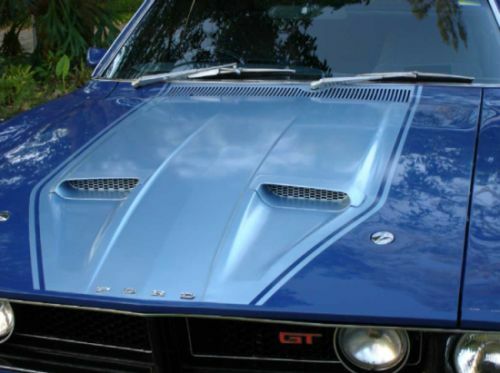 Unfortunately, the car has, at some point, been repainted Cosmic Blue. 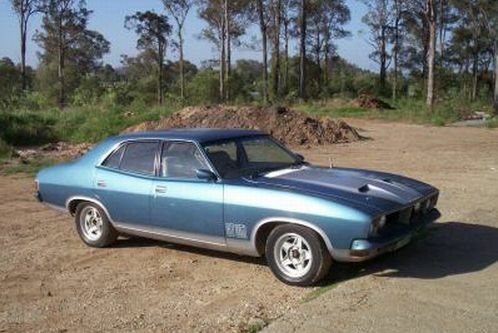 However, parts of the car are stilll visible in the original paint and the owner reports that it is like the XW colour Starlight Blue, but with some more green in it. 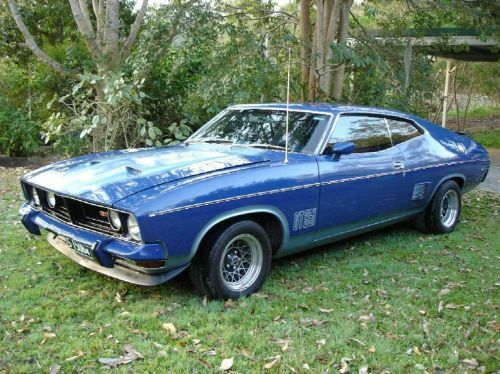 Here is a Starlight Blue XW GT for comparison with the aircraft above. 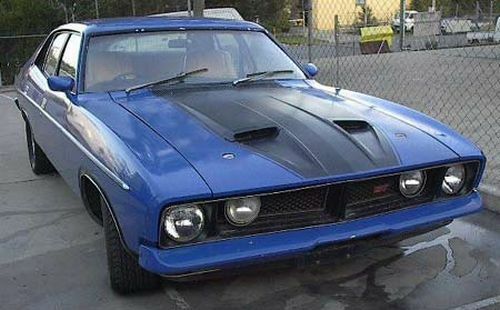 However, the tale of the Ansett Blue XA GT is even more interesting because the car was ordered to be painted Aluminium, just like 12 other XA GT’s. Except, somewhere during the ordering process, Y017 Aluminium became Y107, Ansett Blue. We bet the dealership, and the new owner, got a bit of a shock over that one. 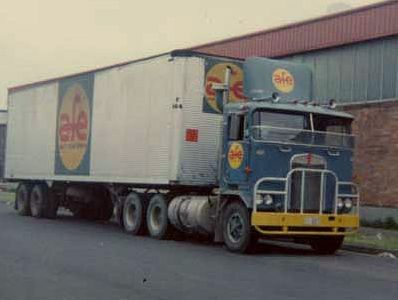 Perhaps as a final hint of what Ansett Blue looks like, there was also a trucking company called Ansett Freight Express, and here is one of their units. Could this be Y107, Ansett Blue ? 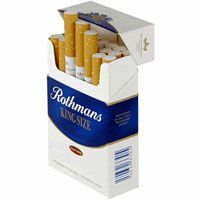 Rothmans are the tobacco company, famous in earlier times for their ‘King Size’ cigarettes with their distinctive blue advertising colour and packaging. 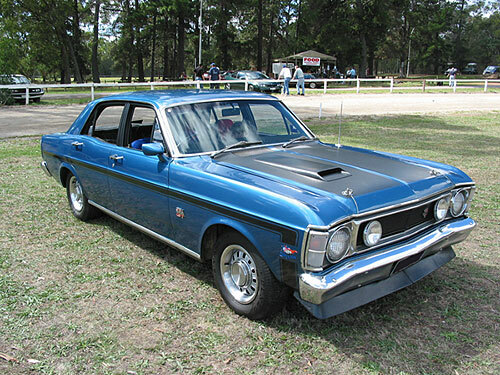 Two XA GT four doors were painted Rothmans Blue, and one RPO83 hardtop. 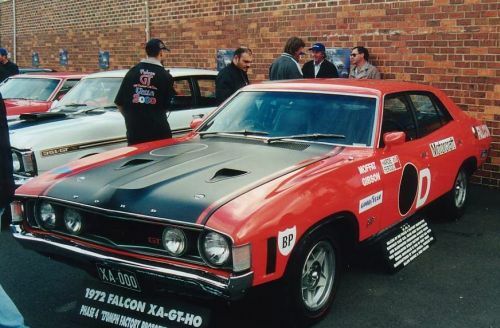 Ford intended to continue using Brambles Red as the colour for what was to be its killer race cars, the logically named and numbered XA GT-HO Phase4. 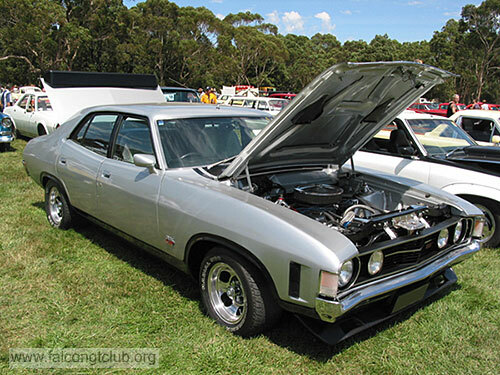 In May, 1972, three four door XA GT’s were walked down the production line and immediately sent to FSV for modification to Phase4 specs, and conversion to two factory racing cars, and one spare. And then the ‘Supercar’ scandal broke, and the Phase4 was cancelled with only these three Brambles Red racing conversions and one, bonafide regular production car - painted Calypso Green - escaping. Two of the Brambles Red cars still exist, as does the Calypso Green car, but the third Brambles Red car was rallied, and subsequently written off. 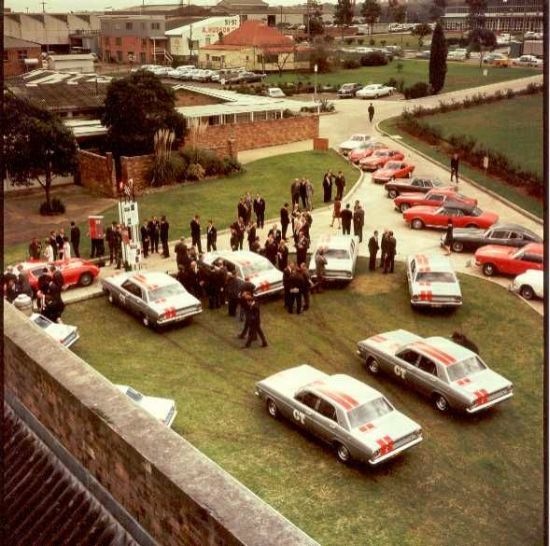 However, Ford built four more Brambles Red four doors, two Brambles Red hardtop GT’s and one Brambles Red RPO83 hardtop; eleven cars in total. A bit of a puzzler this one. 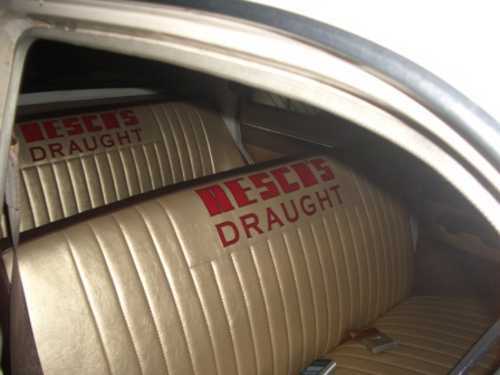 We know that Daimlers were badged Jaguars or limousines. Was there a specific colour called Daimler Blue ? We have the Dulux code for Daimler Blue, 1102, but no way of telling whether it was actually a Daimler colour ? 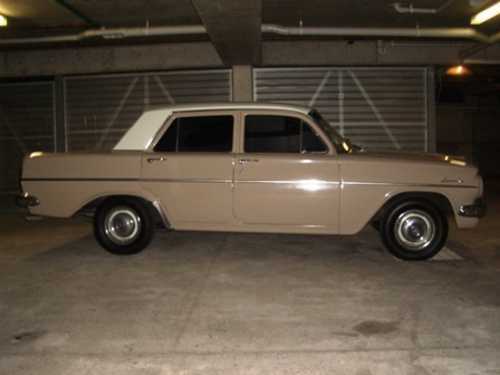 One four door and one hardtop were painted in this unusual and unknown colour. What can we say ? Another, slightly bizarre choice of colour for a car, especially as Ford offered two other white colours; Polar White, code ‘3’, and Ultra White, code ‘U’ or option code Y377 or Z801. So why NSW Ambulance White ? 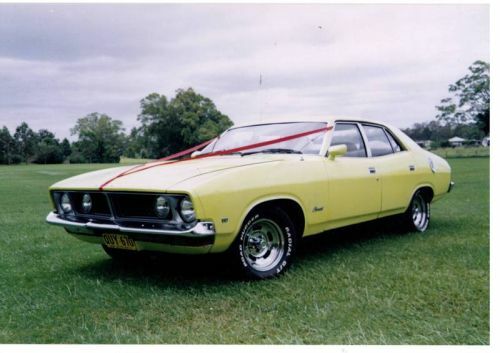 Two built, an October, 1972 four door and a November, 1972 built hardtop. They must have made fast ambulances for someone. Betta Electrical is a chain of electrical goods stores. 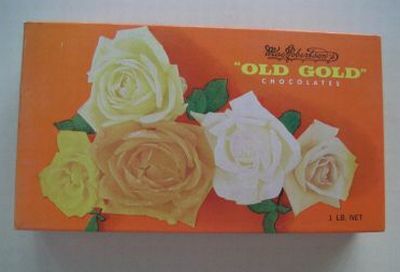 We guess, sometime in their past, that their corporate colour was a primrose shade. 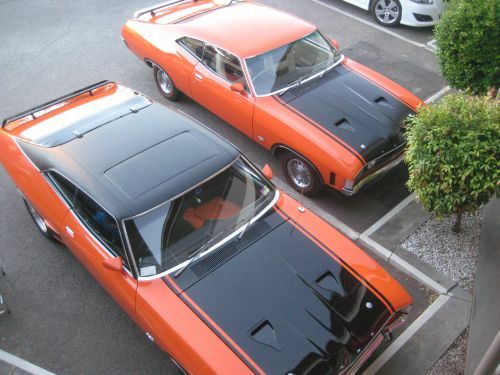 Two XA GT hardtops painted this colour were sold. 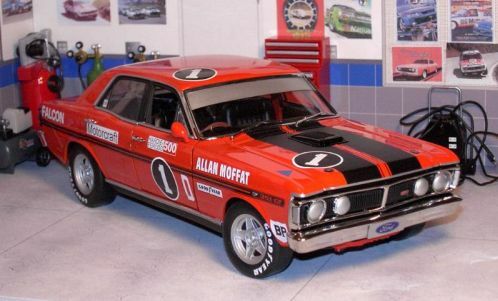 Betta continue an association with Ford by sponsoring a V8 Supercar team, running a BA Falcon. 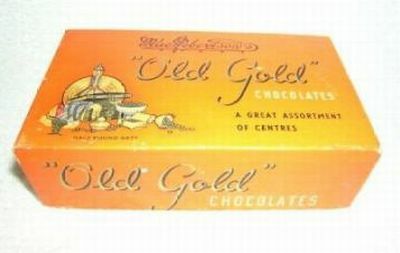 Mac Robertson, or to give him his full name and title Sir MacPherson Robertson, was a renowned Australian entrepreneur of Scottish-Irish descent, who made his fortune in the early part of the twentieth century through a confectionary empire. 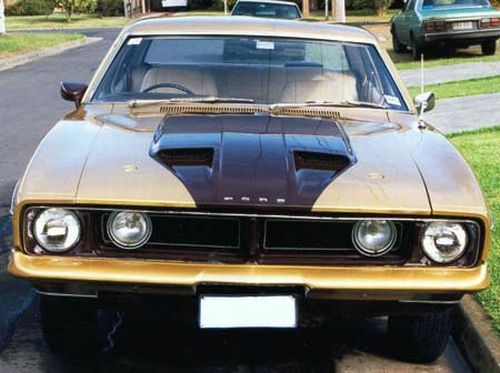 One is his most celebrated products was MacRobertson’s Old Gold chocolates which came in distinctively colured tins and boxes..
Ford built three hardtop XA GT’s painted this colour, one ‘normal’ car in October, 1972 and two RPO83’s in August, 1973. 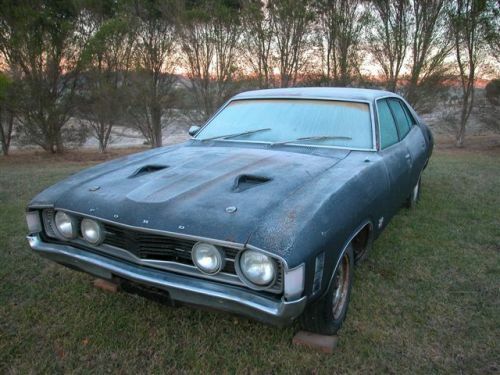 One car has been restored. 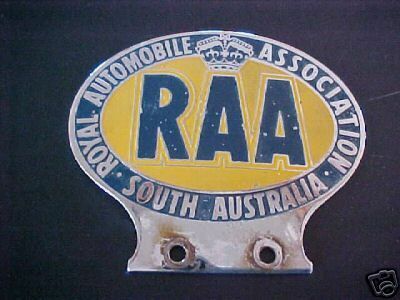 One four XA GT and one hardtop XA GT were painted Royal Automobile Association of South Australia yellow, presumably similar to the earlier RAA Yellow XY GT’s. 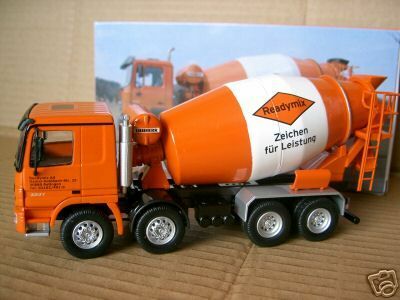 Readymix Concrete are a well known worldwide company whose corporate colour was, and is, orange. 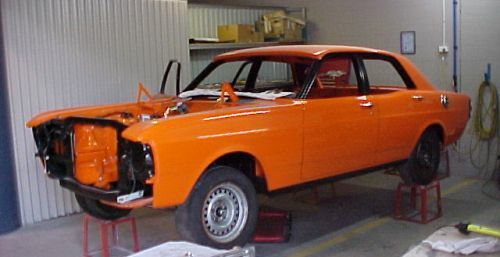 There was one XA GT hardtop built painted Readymix Orange, and it still exists. 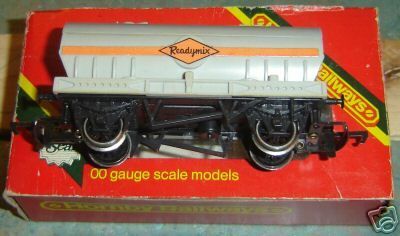 The Readymix Orange XA GT alongside the McRobertson Old Gold XA GT. What better ‘corporate’ colour to offer customers than your own ? 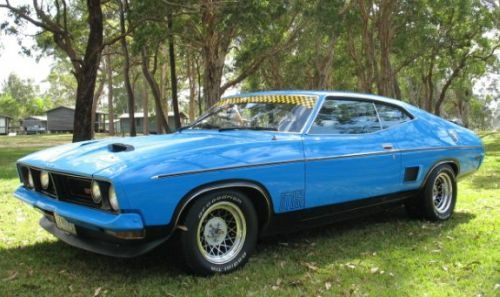 Yes, Ford built one XA GT four door, one XA GT hardtop and one XA GT RPO83 hardtop, and painted them Ford Corporate Blue. There is one other ‘odd’ colour which may or may not be a ‘corporate’ colour: Y266, Bechel Yellow. If anyone knows what Bechel Yellow is, or whether Bechel actually was an organisation, we would be keen to know. 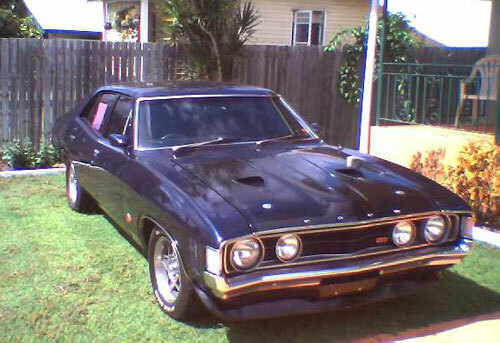 One XA GT hardtop built in January, 1973 in this colour. With the XB range of cars, and considering only GT’s there seems to have been a rainbow explosion of special order colours. Immediately below, we will concentrate on the ‘corporate ones. Y045, Corporate Blue; Y113, Rothmans Blue; Y117, Brambles Red; Y120 Daimler Blue; Y154, Betta Primrose; Y229, C.U.B. Brown; Y244, Pepsi Yellow; Y264, Fanta Orange; Y301, S.T.C. Yellow; Y308, Budget Green; Y314, Rothmans Filter Blue; Y340, Hughes Blue; and Y356, Kwikasair Violet. Quite a few of these have been dealt with before, but just to give a breakdown on numbers produced. Y356, Kwikasair Violet - 2. What could be nicer than painting your Ford car Ford Corporate Blue ? 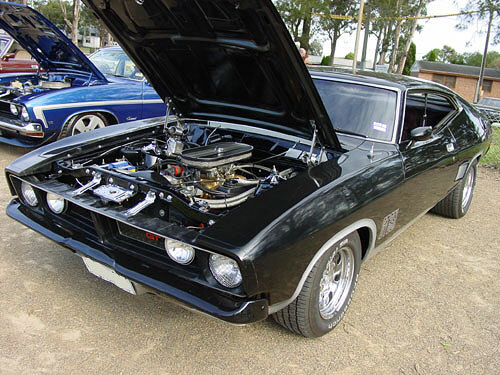 We wonder what it looks like under the bonnet. Hunt the engine, perhaps ? Rothmans Blue in close up. While not a GT, this XB is Betta Stores Primrose in colour. 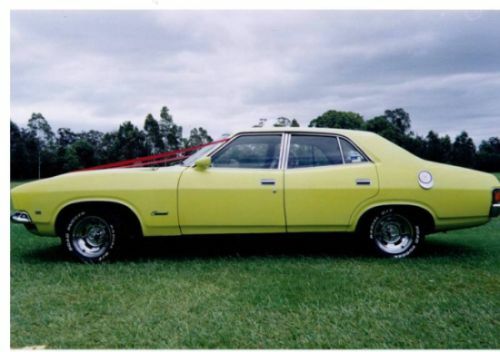 The owner of this car who passed on these photos says that it looks lighter in the shots, whereas, under fluorescent lighting it was closer to Lime Glaze in colour. Thanks, Toby. 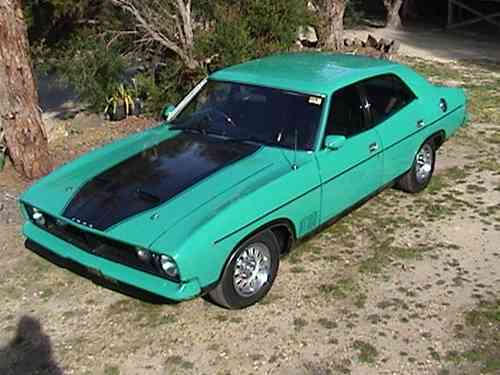 One four door XB GT painted this colour in 1976. Carlton United Breweries are the brewers of, amongst others, Fosters. What is C.U.B. Brown ? 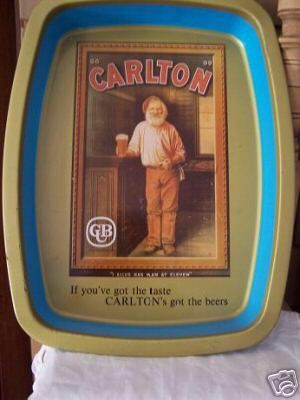 Here is a Carlton drinks tray. Could this be C.U.B. Brown ? As a further matter of interest regarding C.U.B. 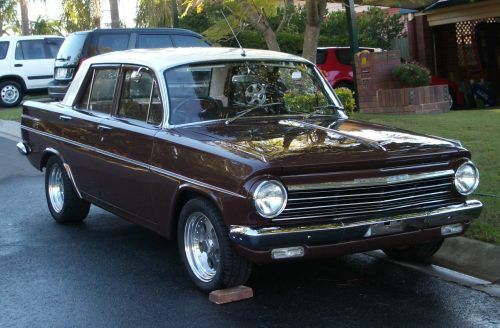 Brown, here is a 1963 EH Holden that was a prize giveaway car by Carlton United Breweries with a custom interior. Is either the interior, or the exterior C.U.B. Brown ? 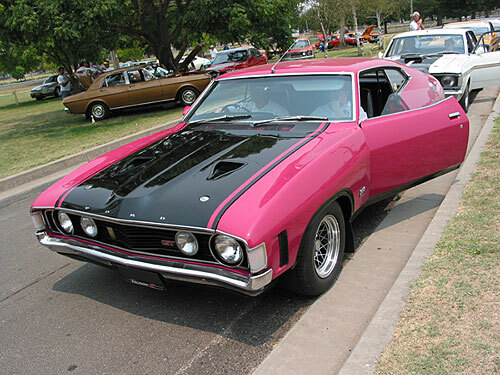 It is worth pointing out that there are two XB GT’s painted Z192 which is also C.U.B. Brown. 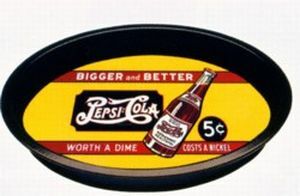 In these modern times so used are we to Pepsi’s red and blue logo that it may be forgotten that a long time ago, yellow was an important part of Pepsi’s image. 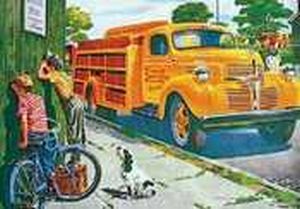 Standard Telephone and Cable Corporation yellow, a Ford fleet colour. Could Budget be the car rental people ? 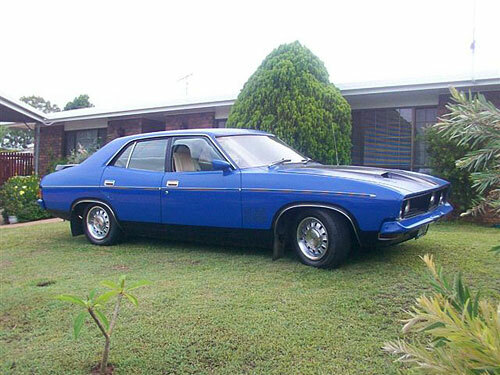 Did they, like Avis, have a ‘corporate’ colour ? Another mystery. Why did Rothmans have two blues ? What Hughes ? Hughes Aircraft Corporation perhaps ? At last, something we do know about. 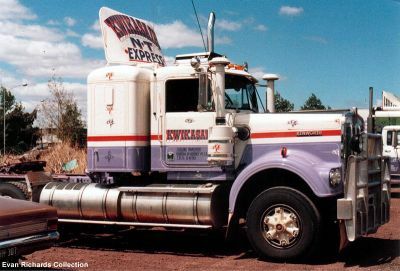 Kwikasair is a trucking and freight company, know for its brightly painted trucks. 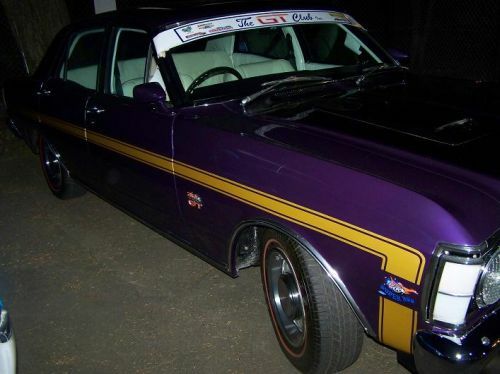 So, what could be better than having your XB GT painted Kwikasair Violet ? Two XB GT’s were built in Y390, Euclid Green. 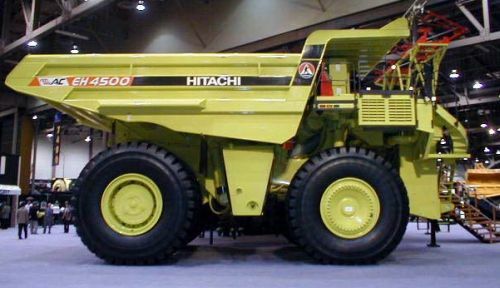 This was yet another distinctive coporate colour as used on Euclid’s huge dumper trucks and heavy plant. 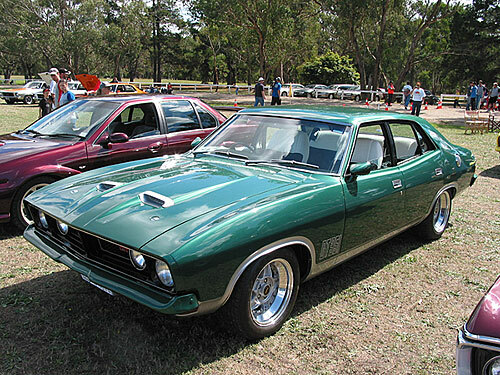 We don’t have a picture of either of the GT’s painted this colour, but here is an XB GS painted Y390. 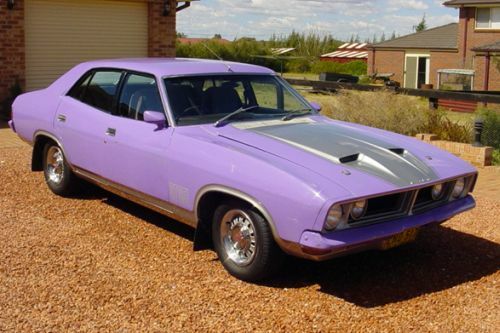 Another great and unusual colour for a Ford. Now for a quick look at the ‘fleet’ colours that were offered by Ford on the GT. 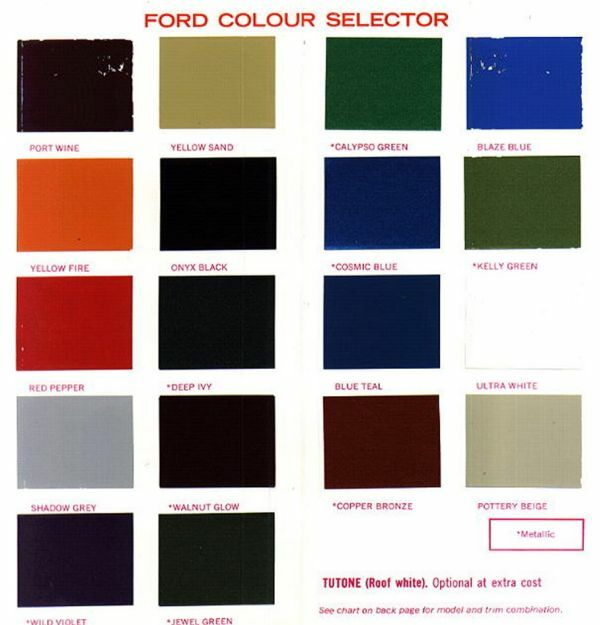 ‘Fleet’ colours were those available in the Ford paint catalogue that were not commercial or ‘corporate’ colours. 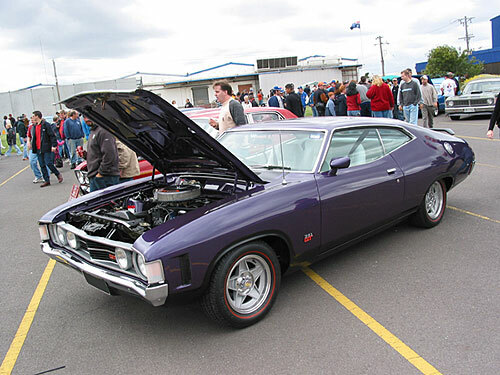 There is some debate about the colour of this car. 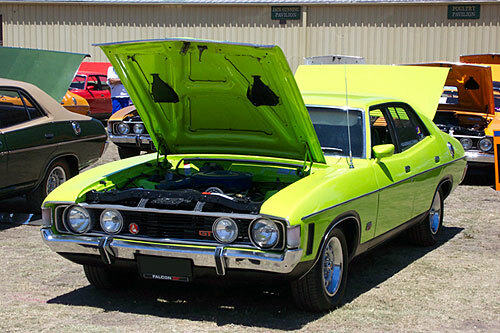 There are claims that it is Y308, Budget Green but no XY was explicitly painted Budget Green by code. 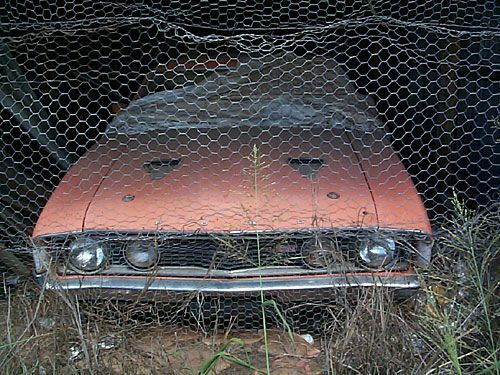 However, some cars had ‘SPEC’ as a code, and this car may be one of them. Some ‘fleet’ colours became standard colours, and as such acquired an alphanumeric code. 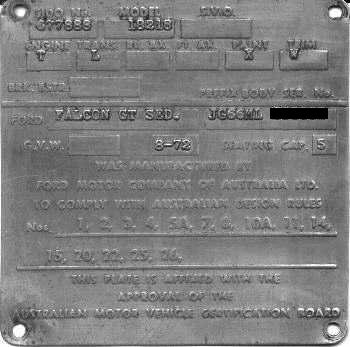 However, the compliance plate could still be stamped with the ‘fleet’ code. 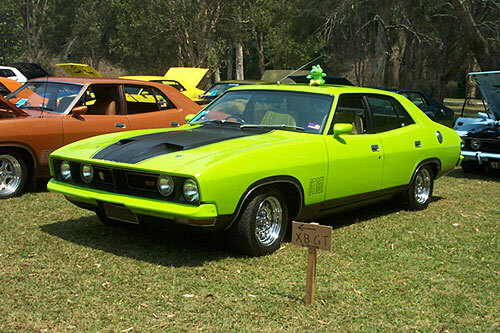 There are some other XB colours worth mentioning. 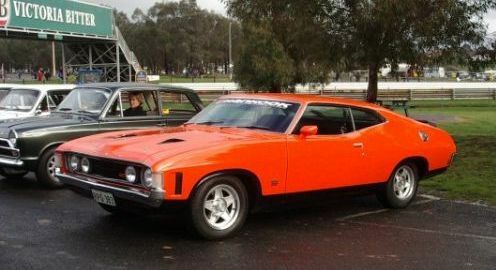 These are the colours used on 1976 built XB GT’s which were actually supposed to be used on the forthcoming XC Falcon, but which were used on the last of the XB’s. There were nine colours: Neptune Blue, Snow White, Blue Steel, Antique Biege, Coolmint Green, Satin Brown, Outback Bronze, Goldrush metallic and Sherwood Green. ‘A’ was Yellow Sand and it became Blue Steel. ‘9’ was Sandstone Beige and it became Snow White. ‘C’ was Sky View Blue and it became Antique Beige. ‘S’ was Yellow Glow and it became Satin Brown. ‘U’ was Burnt Orange and it became Goldrush metallic. The other interesting thing is that there is some evidence to suggest that the Neptune Blue cars used Blue Steel for their paintouts. 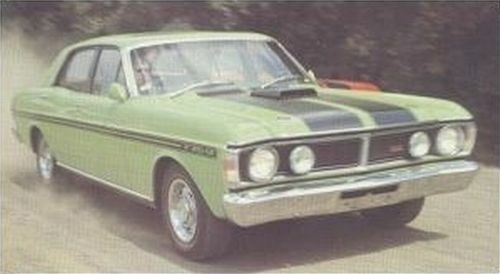 Coolmint Green was also an exclusive Cortina colour. You will notice in the above section about non-alphanumeric paint codes that Y161, Royal Umber is present for the XW, XY, XA and XB. 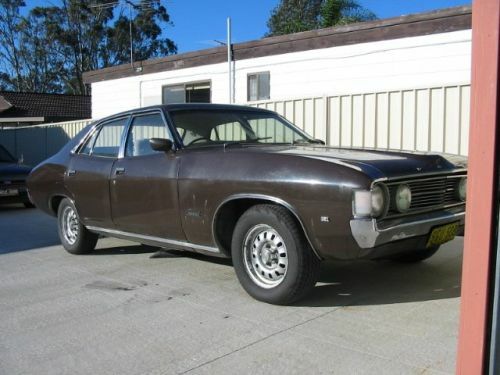 The total numbers are small; XW - 1; XY - 4, XA - 1; XB - 1; but what is interesting is that Royal Umber is a Holden colour. 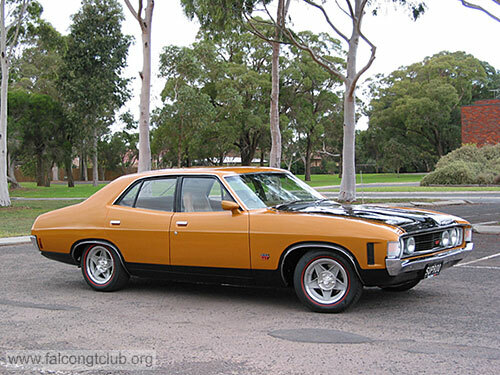 Here is an non-GT XA painted Royal Umber. And here is a 64 EH Holden painted Royal Umber. 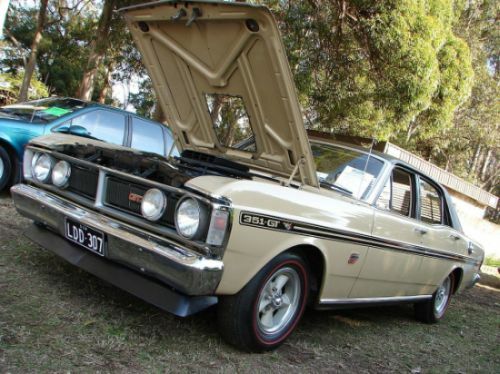 Here is one of the XY GT’s in Royal Umber. Some cars did not have an actual code for the paint. 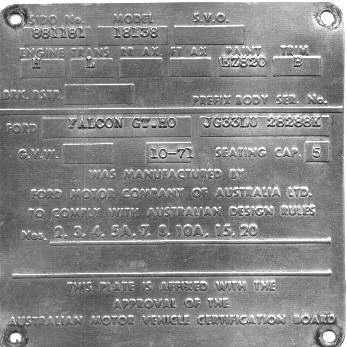 Ford stamped the word ‘SPEC’ for special in the space for paint on the compliance plate. 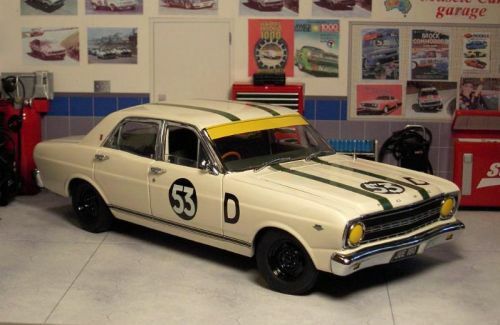 Here is a ‘SPEC’ XY GT, actually painted DeLuxe Biege. 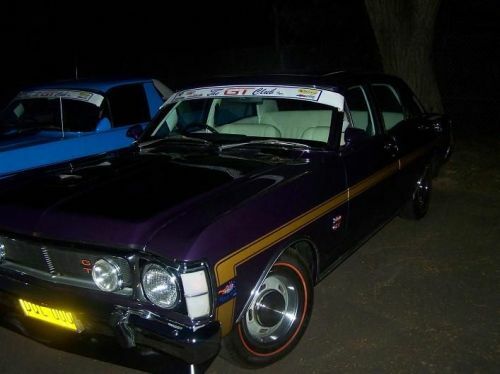 This is an XW that is painted Wild Violet. 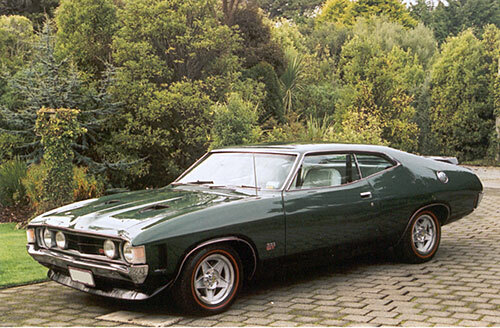 Perhaps one of the XW ‘SPEC’ cars ? 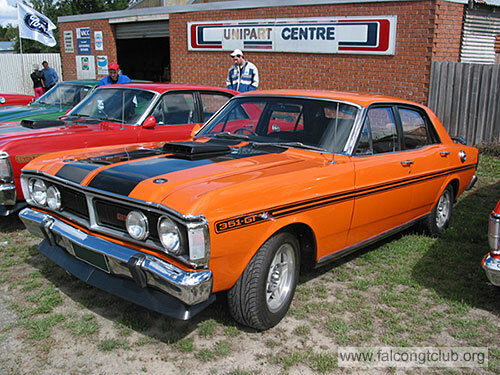 Many of the colour photos of GT Falcons: Falcon GT Club of Australia and their members.